It’s raining Cabinet members, and some say EPA administrator and water poisoning enthusiast Scott Pruitt’s time is running out. 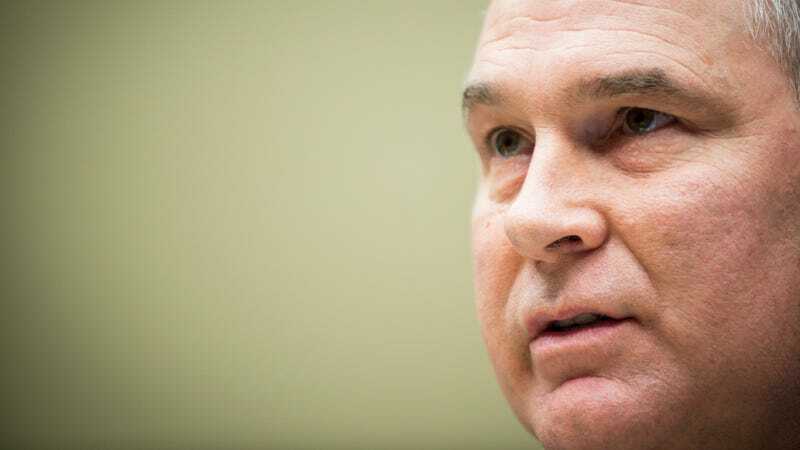 Others say “I hope he’s going to be great.” In the end, it might not matter enormously, as he could very easily be replaced by that redheaded Koch boy who designs button-down t-shirts decorated with money bags, but Pruitt’s overwhelming corruption certainly is taking up a lot of headline space that the president would prefer for himself. Anyway, what’s really important right now is that we guess what time Scott gets canned. Will it be at 3 p.m.? That would certainly be a little early, since it does seem like Trump needs a bit more time to stew. But the president has been feeling freaky lately, and yesterday even called him a “good man,” which sounds like escalation to me! Will it be at 6:30 p.m.? This would be the most reasonable time, in my opinion, since it is a nice way to punish reporters and bloggers; a Jezebel editor will have just scheduled Barf Bag, so that when it goes up Jezebel’s commenters will helpfully wonder why we missed the big news of the day. Will it be at 10 PM? This would be unpleasant for everyone, including the communications team at the White House, but would also be a fantastic opportunity to catch Scott Pruitt while he is on the toilet. Well, it looks like a toss-up. Before Scott Pruitt gets fired, please do let us know in the comments what time you believe Scott Pruitt will be fired. Will Condo-Gate Take Down Our Dear Friend Scott Pruitt?